South Korea and the European Union (EU) will start their fourth round of negotiations in Seoul on Oct. 15 with some sticky issues to resolve, including a dispute over cars. Fresh from reaching a trade accord with the United States in April this year, Seoul held three rounds of negotiations with Brussels to achieve a free trade agreement that could provide Asia's third-largest economy with a commercial bridge to Europe. But negotiations hit a roadblock because of disputes over tariff concessions, in particular over cars, casting a dark cloud over the goal of reaching a deal by year's end. Ahead of next round of free trade talks that run through Oct.19, Kim Han-soo, South Korea's chief negotiator for the talks, said striking a free trade deal with the 27-nation economic bloc would not be easy. "It is possible (for Seoul and Brussels) to forge a deal by the end of the year... but it is difficult task," he told a radio program earlier in the day, implying tough negotiations ahead. Kim said South Korea is trying to iron out problems that have dogged the talks, adding that the government will thoroughly prepare for next week's negotiations and do its best to reach a balanced agreement, reflecting the interests of both sides. In a bid to give new impetus to negotiations, South Korea said earlier this week it may sweeten its tariff offer to the EU. Since the first round of negotiations in May this year, the EU has offered to eliminate or phase out all its import tariffs on South Korean goods within seven years, and remove tariffs on 80 percent of the goods within three years after a deal comes into force. Seoul says it would remove all tariffs on industrial goods within three years with some exceptions, and eliminate tariffs on roughly 68 percent of EU goods as measured in value in three years, compared with 63 percent in a previous offer. But the EU expressed disappointment with South Korea's offer, saying it falls short of the accord signed with the United States in June. The EU is demanding that South Korea match reductions on beef and car-import tariffs that it granted the U.S. in June. In particular, Brussels wants South Korea to cut down regulations for European carmakers by applying international standards instead of different domestic rules. South Korea held out for an improvement in Europe's offer to eliminate a 10 percent tariff on imported autos within seven years. South Korea sold 74,000 autos worth US$9.1 billion in Europe last year while buying only 15,000 vehicles worth $1.6 billion. The country's tariff rate on cars is 8 percent, compared to 10 percent for the EU. 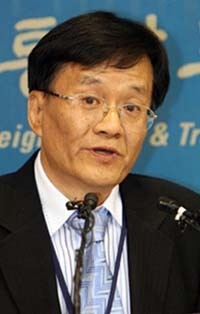 In its trade deal with the U.S., the world's largest economy, Seoul agreed to remove an 8 percent import duty on cars. In return, the U.S. agreed to remove a 2.5 percent duty on South Korean car imports and a 25 percent levy on truck imports. The EU is South Korea's second-largest trading partner after China, with bilateral trade reaching $79 billion in 2006. Some unofficial studies suggest a free trade agreement would boost that figure by as much as 40 percent in the long run. If implemented, the free trade pact would be the largest for South Korea, surpassing the agreement signed in June with the U.S. that is still under legislative review. The EU is also the largest foreign investor in South Korea, with $40.4 billion invested as of the end of 2006. Currently, South Korea has free trade agreements with Chile, Singapore, the European Free Trade Association and a partial pact with the Association of Southeast Asian Nations. Seoul is also seeking similar trade deals with Canada, India and Mexico.